Members of the opposition under the For God and My country pressure group have been blocked by the police as they tried to access the Congolese Embassy in Kololo. The group that walked from the Inter-party Cooperation office on along Katonga road had gone to deliver a petition on Sam Mugumya. 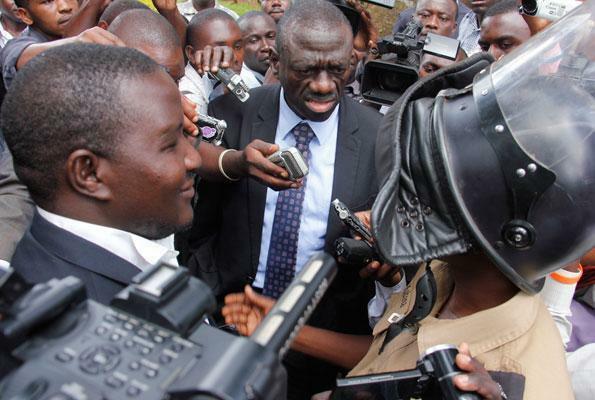 They are protesting the arrest of Besigye’s aide Sam Mugumya under what they describe as unclear circumstances. Mugumya was arrested two weeks ago and according to the UPDF he is held for alleged involvement in rebel activities, while the Congolese government says he is being held for illegal entry into the country. The group led by FDC’s Kiiza Besigye, also includes city Lord Mayor Erias Lukwago, Masaka Municipality MP Matias Mpuuga and Kawempe mayor Mubarak Munyagwa. A scuffle however ensued between the Regional Police Commander Kampala East Siraje Bakaleke and the group after they were denied access to the embassy. Bakeleke insists that they seek a formal appointment through the foreign affairs ministry before they can be allowed access to the embassy. The A4C is now seeking visas to travel to Kinshasa on Thursday in an attempt to secure Mugumya’s release.